There is only one version of this light. This is a fun little light, with nice reeding that allows easy operation. I like the full package, but with low was a little lower. The cell is internal, and not removable (but is included). This package continues the trend of Olight’s “new” packaging. It’s serialized, and sealed with a tear strip. It’s also very slim overall, which I appreciate. The light is held securely by this tray. That clear plastic tab at the top allows separation of the back, where the manual and cable are stored. The manual is good. This is a simple light, but the manual does a good job describing things with pictures and text. Quite thorough. Most of the small lights I have like this are brass. So the first thing I noticed when I picked this one up is that it’s very light. But being surprisingly lightweight isn’t an indication of poor build quality. In fact it’s welcome in this small keychain light. Something I’ve already mentioned that I’ll say again that I like about this light: the reeding on both the head and tail. This promotes great grip and allows easy twisting of the light for switching between off and the two modes. The body has the cell encapsulated, and there’s a brass button coming off that. The head has aluminum contact points, and the positive contact is actually a button that allows switching between high and low. The threads on the body are unanodized but there is no physical connection with the positive terminal until the light is actually on. Ie, there shouldn’t be any parasitic drain. The positive terminal is surprisingly ever so slightly springy. Officially 41mm x 14mm, and 12g. This is a tiny light. Here’s how it stacks up against the Lumintop Tool AAA, the Maratac PCL, Mecarmy Illuminex-3, and the Convoy S2+. This light is essentially the same size as just about all the 10180 lights. There’s only one option for attaching to the I1R. That’s the split ring, that comes installed on the tail of the light. It’s a very small split ring, but still sticks out a little past the body of the light. It is removable. Unfortunately the peg that this attaches to is not removable. That means the light will not tailstand at all, which is a little frustrating. I’d love for this to be a quick release, but that’s probably a bit much to hope for. The cell built into the light isn’t named so far as I can see, but it’s a Li-Ion cell, most likely a 10180. Common 10180 cells are around 70mAh. The cell can not be replaced. Here’s a runtime on High. The output seems to track with cell voltage fairly obviously, and with the light also having no LVP, this is a simple driver. I’d like to see at least a short amount of time at a steady output, and I’d certainly like to have LVP. My meter can’t reliably pick up 5 lumens, so the runtime on Low (which I did perform) was full of useless data. As you’d expect with an internal, non-replaceable cell, this light has on-board charging. This is done by micro-USB. The port is hidden under the head on the body, and the head must be removed fully to charge the light. 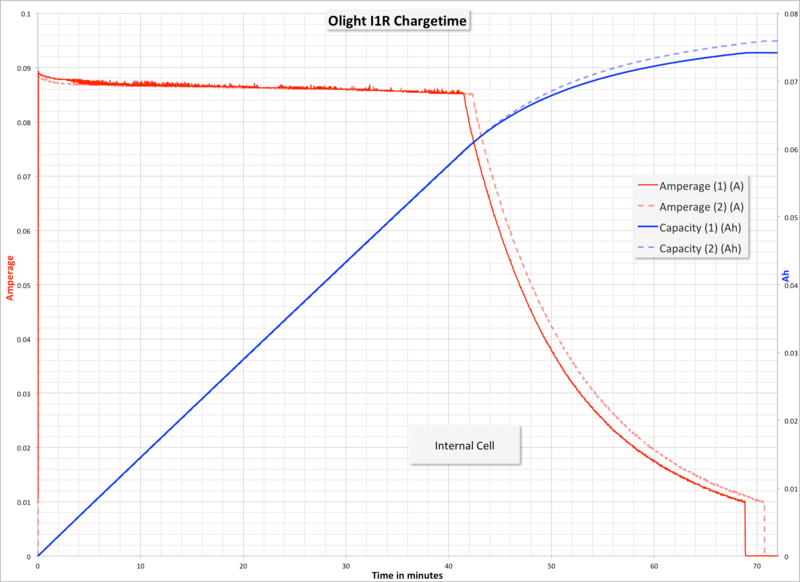 The charge graph looks great, and gives us an indication that the cell is actually around 75mAh as we expected. 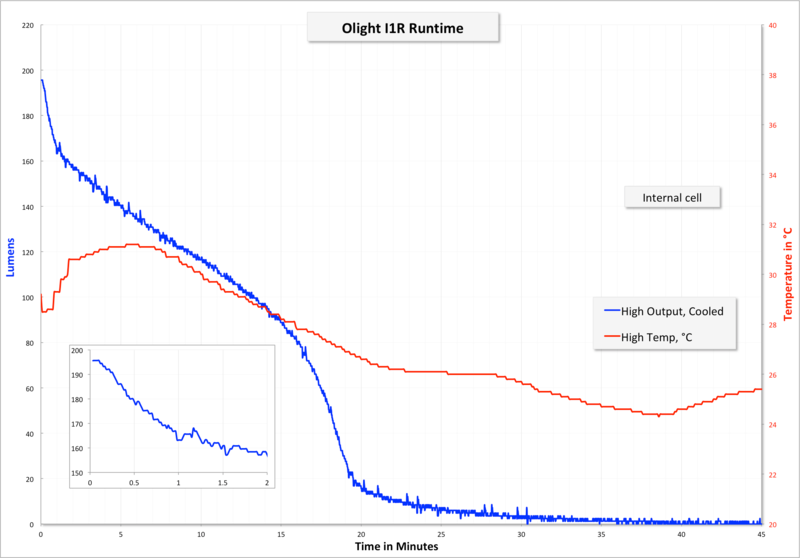 Charging finishes withing the 1h15m that Olight claims. The light is a twisty. It’s very simple to operate too. Twist for Low. Twist tighter for High. Loosen from High for Low. Loosen from Low for off. That’s it. The emitter is a Philips LUXEON TX, which is the same as in the I3T. It’s a fine emitter, but a little cool for my tasks with this light. The reflector isn’t a reflector, it’s a TIR. Possibly my favorite type TIR, too – the beam is tight (but not throwy) and gives a good spotlight with sharp edges. You might want something more floody if you’re using it on your keys, but I think it’s very good as it is. I do with that Low was a little lower, even though it’s rated at 5 lumens. There are many twisty 10180 lights. This one’s nice (?) because the cell is internal, and one less thing you have to futz with. That also means it’s not replaceable. I have a charger and another flashlight in the works! Stay tuned! This light was provided by Olight for review. I was not paid to write this review.